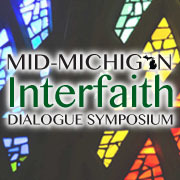 On Sunday, April 19th I attended the Mid-Michigan Interfaith organization’s first ever Dialogue Symposium, to which I was invited to present on Wicca. 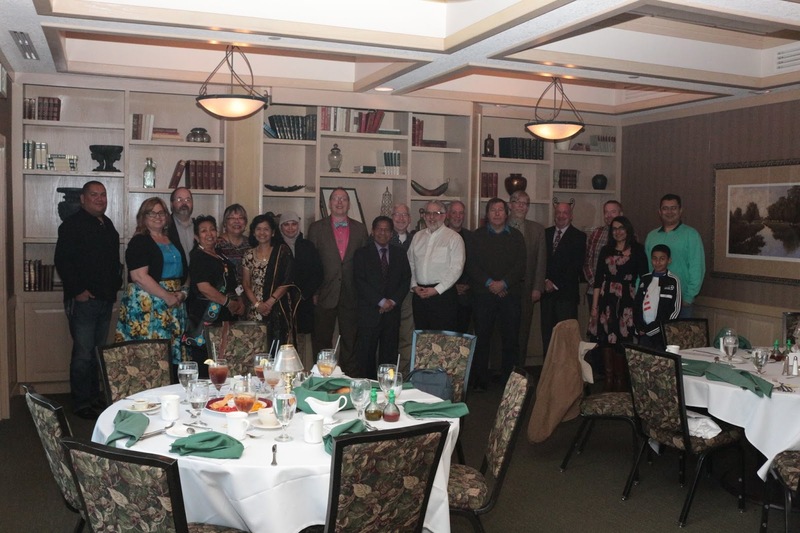 The event was preceded by a Saturday evening dinner for all the presenters and I had a wonderful first meeting with Sikhs, Muslims, Christians, Baha’is, Native Americans and several others. 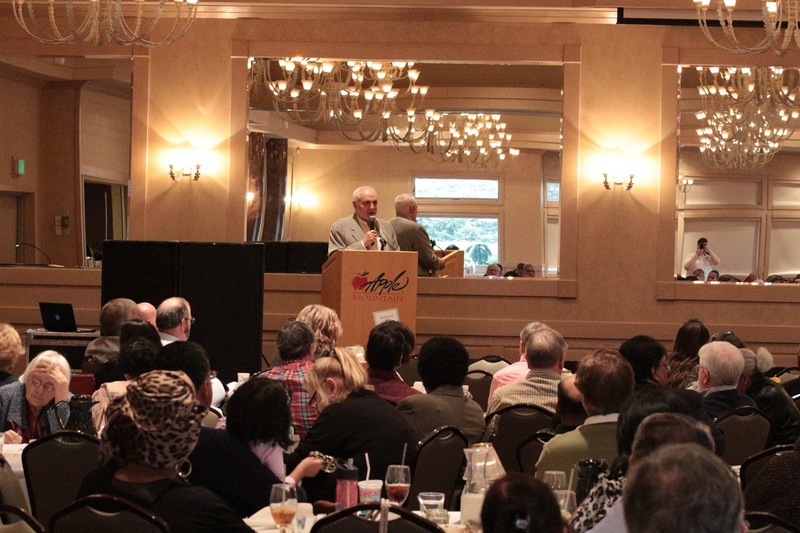 The event was held at the Apple Mountain Resort in Freeland, Michigan, which is rather central to the state’s Tri-cities of Saginaw, Midland and Bay City. I had been made aware of this event through my new friend Peter, who I met at the NAIN Connect in Detroit last August. Peter represented Congregation T’chiyah, a Reconstructionist and highly inclusive synagogue serving Metro Detroit from its Oak Park location. Earlier, after checking into my room at a Sheraton, I had the pleasure of meeting the organizer, Will Westerfield, along with his friend and our Lunch Plenary presenter Lelanda Lee from Colorado, Rev. Mike Weirnick and his husband Joel, all serving in the Episcopal community. We had a thoughtful conversation that included topics of inclusiveness and quantum physics. Lelanda has a distinguished career in the Episcopal Church highlighting women’s issues internationally as well as poverty, social justice, racism, Public Education, criminal justice, immigration and more. While Will went ahead to the dinner to meet other arrivals, the four of us drove ourselves there and continued to enjoy conversations that covered various topics. I introduced them to a recently coined term; “ammosexuals”, sometimes used to describe Open Carry advocates by people favoring less of the NRA influence in the US. Dinner was splendid, at the conference site, the Apple Mountain Resort, about 12 minutes from the Sheraton. I sat at a table with Mike, as well as David Strand, who presented an Introduction to Bahia Faith the following day, ironically against my own presentation. Others who sat at my table were Dr. Karunakaran, a surgeon who helped found the Hindu Temple of Saginaw, Dr. B.J. Singh, representing Sikhism, as well as their wives and others. There was light talk and several Middle Eastern appetizers before we had seated. I enjoyed a Cobb Salad and rich Lobster Bisque but went light on dessert. David tried to tempt me with his Salted Caramel Ice Cream, to which I had a taste, but otherwise avoided the many incredible offerings available. Since we were all co presenters, we all introduced ourselves and talked throughout and after dinner, going nearly 3 hours. I chatted with UU minister Jeff Liebmann and his wife about Pagans and Wiccans who also attend UU services and events. I have also done programs or attended events at the Detroit UU, back in the early ‘90s and was an Ad-Hoc member of the Detroit CUUPs group there. Since we had a Noon checkout time and would be at the conference site down the road, my new friends and I decided we would check out and drive separately to the conference and then be able to leave afterwards. I arrived early to find only a small handful of folks, so I was able to relax, enjoy coffee and chat with a couple of attendees. One of the most remarkable things for me, working in Interfaith, is that I don’t have to over explain Wicca or Modern Witchcraft to most folks. Indeed, some were quite knowledgeable themselves and so conversations moved to intermediate points or aspects needing clarification. After the introduction to the seminar, I moved to my first workshop, Mysticism across the Traditions, by Dr. Ray Lacina, PHD, a converted Muslim since 1989, who also studies and teaches about mystical principles as they appear in literature across the world. Gentle, thoughtful and provoking, the class used many contemporary and classic works of literature to show the central ‘alikeness’ of the world’s mystic, spiritual and religious thought. Dr. Lacina has worked in local Interfaith, in the Midland, Michigan area since 2001. Next up was 5 religiously Diverse Friends Get together and Discuss Evolution, which was about as cool as that sounds. Facilitated by Dr. Jon Cleland Host who is somewhat controversial in the Pagan world (http://humanisticpaganism.com), along with his Catholic, conservative Christian and Humanist friends restage a several year monthly discussion about religious and humanist views of evolution. It was lively and funny and was one of the better examples of people being able to remain friends and colleagues under very different viewpoints and beliefs. In between workshops I did speak with Dr. Host about more Pagan matters including his panel appearances at the last several Pantheacons. Then it was time for lunch and the opportunity to attend one of several breakout sessions so I chose the Beijing Platform with Lelanda Lee who gave an excellent presentation with slides, covering her remarkable work with women around the world in various organizations. There was a lot of emphasis on and from Lee’s partners, from across the spectrum of humanity, mostly of color showing the progress that has been made in the last 20 to 25 years but also addressing the concerns of where the work needs to continue and be amplified. Still there was much to celebrate in Lee’s story both personal and vocational. She is truly a great worker for women and their concerns and I found her charming and gracious in our personal conversations. Hope I get to see her again! The final session of three breakouts included my own, The Discovery of Witchcraft: An Introduction to Wicca and Modern Witchcraft. Many folks attended one of the other two sessions, especially Native American Healing Practices and other Traditions, hosted by Beatrice Jackson, but I did have an attendance of 2 dozen-30 or so folks. Although I had some technical problems at first, setting up my PowerPoint display, Ray Lacina was very kind to get me through and off I went. Since this was my actual first ‘big’ presentation to a non-Pagan audience I think it went okay. The day in general suffered from some small delays, mostly due to some technical setup issues, but as a first time ever symposium I have to give my best to Will and his staff for an incredible and well down event. 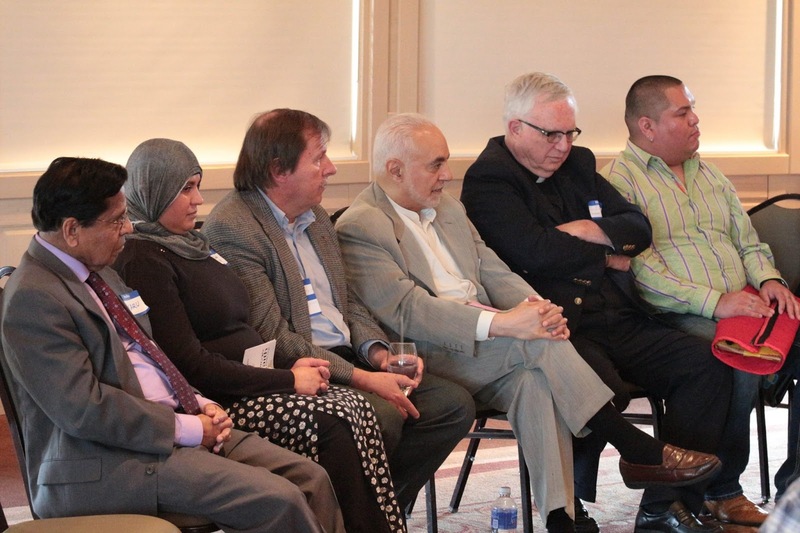 I learned a lot and felt truly a peer in the community of Interfaith. So, due to some of the delays I needed to wrap up my presentation a little quickly but still served well. From my summation, Most Wiccans, most Pagans do not believe that our ways are suited for many or most people. But we are increasingly more aware of where we do fit in to the modern Paradigm. As we continue to head into more and more uncertain times, working in Interfaith with our spiritual brothers and sisters is the most fitting accomplishment we make for our shared world and ourselves. In total, there were 12 breakout sessions including mine with a bit of diversity that included Sikhism, Hinduism, Bahia, and Native American topics and concepts. There was a workshop addressing Christian Exclusivity as well as the Intersection between politics and religion. After the final breakouts, which included my own, there was a panel discussion, which I attended. Most of the questions addressed to us were light, though thoughtful and allowed others and me a moment to quip about something fun or happy about our religion or path. A particular line of question drew forth the fact that many modern Pagans don’t have structures they can openly practice with others, actual temples or houses of worship and I felt I was slightly needled by the participant next to me, who, as an aside comment implied that lack of an actual church or whatever meant we weren’t a legitimate practice or belief. But overall the tone was warm and reverent. With the breakout sessions and panel concluded there was a prayer service with all presenters on stage. I read the Charge of the Goddess, Silver Ravenwolf’s version, as well as sung a couple of songs, which were accompanied by wonderful performers Benjamin, and Analisa Gauthier (www.benjaminsmusic.com). Then came a wonderful Buffet dinner and a cash bar and other refreshments, followed by a tableside Dessert tray. Over the meal Imam Feisal Abdul Rauf gave the Keynote speech, which comprised many of his experiences as a major proponent of Muslim-Western relations. His career has spanned many years with in Faith and Diplomacy issues, with many awards including Eleanor Roosevelt Human Rights Award (2011) and he was also listed as one of Time Magazine’s 100 most influential people of the world (2011). Rather than stay for the final concert performances, which I’m sure were splendid, I did leave after dinner, finishing my good byes and hugs to new friends and beginning the 2-hour drive back home. I really enjoyed my first big presentation and hope I am able to come again for future symposiums. It has been a great experience to attend this event. With respect, In Her Service, Oberon Osiris.